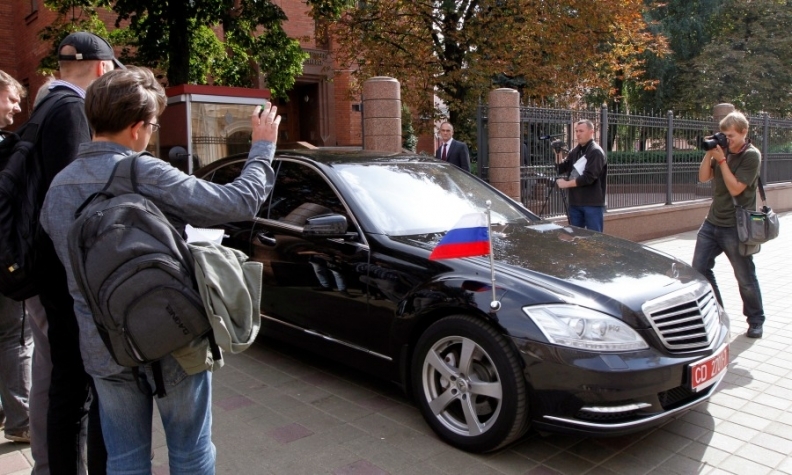 Russia's ambassador to Belarus leaves a meeting in a Mercedes-Benz car. Russia plans to limit the purchase of imported foreign cars for state use. MOSCOW (Reuters) -- Russia plans to restrict state procurement of imported cars in a move aimed at helping domestic carmakers to weather a slump in demand. Russia's Industry Minister Denis Manturov said today that a draft resolution on restricting the purchase of imported cars by state institutions and regional governments has been submitted to the government, Russia's Interfax news agency reported. "It is to be issued and start working in the nearest future," Manturov was quoted as saying. Russian new-car sales fell by 6 percent last year to 2.78 million units, bringing to an end three years of double-digit growth and delaying the country's move to succeed Germany as Europe's No. 1 market. In the first two months, deliveries have fallen 4 percent, according to the Moscow-based Association of European Businesses (AEB). Lada, Russia’s biggest domestic carmaker, has seen sales fall 19 percent in the same period. Russia's faltering economy and a developing crisis with the west over Crimea have led to a sharp depreciation of the ruble and an increase in prices for imports, prompting Russians to delay making large purchases. Although western carmakers have invested heavily to set up local production with an eye to tapping demand from Russia's growing middle class, many parts still come from abroad, making prices vulnerable to fluctuations in the ruble’s exchange rate. Manturov said the government did not have any immediate plans to support the domestic car industry with lending subsidies as was the case in 2013. The ministry earlier forecast that Russian car sales might fall by between 3 percent and 7 percent this year.